Our Coach Builder's Glass Carrier range can be fitted to Berlingo, Dispatch and Relay panel vans, making Citroën an attractive prospect for any glass company. 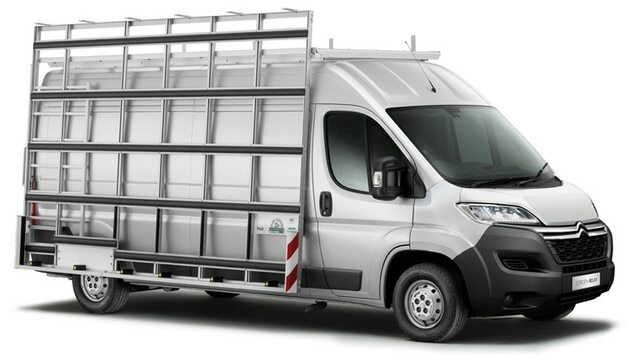 Low loading heights across the Citrën van range provide safe and easy loading. On Relay in particular, the vast internal space allows the fitment of an internal racking system providing a safe and secure transport of glass inside the vehicle which can be easily loaded and unloaded thanks to a class leading low load height. Citroën & DS Ireland Ltd does not accept any liability whatsoever and howsoever incurred in respect of works carried out by such independent Companies, and customers must assure themselves of suitability, quality and legal conformity of such conversion works.